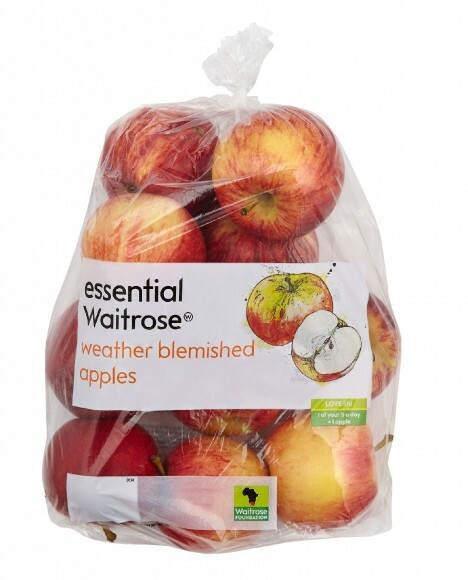 Waitrose is introducing weather blemished apples from its South African farms. The move follows unseasonal hail which has superficially damaged 70 per cent of Waitrose farmers’ crops in South Africa, Kenya, and Ghana. The apples, which come in 'mixed' bag form, containing Royal Gala, Cripps Pink, Braburn and Nicoter varieties, will be available in Waitrose stores until late August. Greg Sehringer, Waitrose's apple buyer, said: "We’re happy to be able to support not only our own farmers in the UK, but suppliers abroad who are occasionally hit hard by fluke weather. "We are lucky that our customers are savvy enough to understand the unpredictability of farming, and to trust that the fruit will be just as delicious, even if the apples don’t look as perfect as usual." Pieter Graaff, a farmer in the Witzenberg valley, South Africa, who has been a supplier to Waitrose for over 10 years, lost approximately 75 per cent of his fruit with hail marks to the skin. He said: "I’m overjoyed that Waitrose have offered me the opportunity to sell the fruit to them which would normally just go to waste." In 2011, Waitrose pioneered the sale of ‘ugly’ weather-damaged apples from the UK, when growers were left with damaged crops after severe frosts.